Japanese Crispy Chicken Wings – easy recipe that produces the crispiest and best Japanese-flavored chicken wings ever! As a Japanese food lover, I am very lucky that I live in southern California. Many famed Japanese restaurants and chains hailed from Japan can be found in the Greater Los Angeles area. One of my favorite Japanese restaurants is Furaibo (風来坊), which is originated from the city of Nagoya in Japan. Furaibo is famous for its delicious and utterly addictive Nagoya-style tebasaki, or seasoned fried chicken wings which is a specialty food of the Nagoya region. I have had some great chicken wings, but the tebasaki served at Furaibo is a class of its own. The wings are lightly coated with flour and deep-fried. The surface of the wings are extremely crispy, dry, crackly, and lightly dusted with their secret dry seasonings. A bite into the chicken wing reveals the deep flavors of the glaze—savory, slightly sweet, and oozes umami. Furaibo Nagoya-style tebasaki are simply irresistible. After eating at Furaibo almost every week, I have finally decided to attempt the tebasaki recipe at home. I did a quick search and found a tebasaki recipe from Nagoya International Center. Based on the recipe and with my wild guesses, I developed my own tebasaki recipe. The verdict: my recipe is good and close to the taste I was trying to achieve. The texture of the chicken was almost spot-on as I deep-fried the wings twice at 300 degree Fahrenheit and then at 375 degree to crisp up the skin. For the glaze, I added a little extra umami by adding Mizkan Bonito Flavor Soup Base to the recipe. I also decided to present the tebasaki in a bento box, with steamed rice speckled with black sesame seeds, tamagoyaki (Japanese rolled omelet), and salad. If you are curious about tebasaki and its taste, you should definitely try out my recipe. It is very important that you buy smaller chicken wings (look for party wings). Bigger wings will not deliver the desired results. I can assure you the end result of crispy and tantalizing chicken wings are well worth the efforts, and that you will really enjoy this tebasaki or Nagoya fried chicken wings bento. Rinse the chicken wings thoroughly and pat very dry with paper towels. 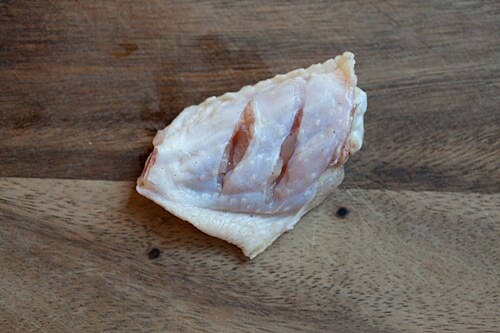 Score the bottom part of the wings with two diagonal slits. Season with salt and white pepper, and lay the chicken wings on a flat surface to air dry for 30 minutes. Heat up a deep-fryer to 300°F. Lightly coat and dust the surface of chicken wings with the potato starch. The coating should be very thin. When the deep-fryer is ready, fry the chicken wings for 8 minutes or until they are light brown. Remove the wings and turn up the heat on the deep-fryer to 375°F. Add the wings and deep fry for another 2 minutes or until very crispy. Remove and place on a paper towels to absorb the excess oil. Heat up all the ingredients in the Glaze in a small saucepan on low heat. Simmer until the glaze slightly thicken. Add the wings into the saucepan and toss around to make sure that each wing is lightly coated with the Glaze. Shake off the extra Glaze off each wings and transfer the wings to a bowl. Sprinkle some white pepper powder (to taste) on top of the tebasaki and toss around a few times. Top with sesame seeds and serve immediately. Arrange the tebasaki in the biggest compartment on the bento box. Follow up the steamed rice topped with black sesame seeds. Add the cabbage salad and drizzle some Mizkan Mizkan Yuzu Citrus Salad Dressing on top. 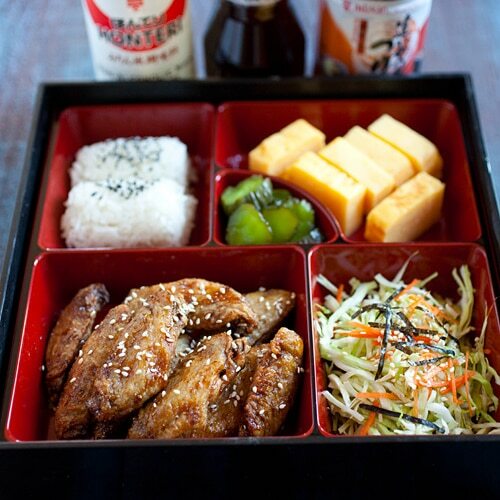 Arrange the tamagoyaki and pickled cucumber in the bento. Use only the middle part of party wings. Do not get the regular or bigger-sized chicken wings. This looks so yum! I look forward to trying it. I live in LA and love Furaibo. Do you know the recipe for their spicy wings? Is potato starch or potato flour more commonly used for deep frying? I saw a similar recipe that uses potato flour. Potato starch makes it crispier. Would rice flour work too? My mom likes to dust stuff with rice flour because she says it makes it crispier. Anyway, very yummy looking wings. Perfect as finger food for a party or get together, I would say. Yeah, or combine it with the flour. I’ve tried so many of your recipes and they were ALL delicious! Can’t wait to try this one. It looks yummy! Chicken wings are always a favourite, and I bet these would be a great for my next party! Yum! Is there a substitute for the Mizkan bonito soup base? These look fantastic! When I lived in Osaka I sailed a yacht named “Furaibo” for years. What fun memories! Will corn starch have the same effect?